Happy Monday everyone! So my week of going 'unplugged' is over and I must say, it was hard to stay away from posting something new! Even though the short break was very much appreciated, I'm more than ready to be back to my normal posting schedule! I wanted to start the week off with some outfit inspiration! 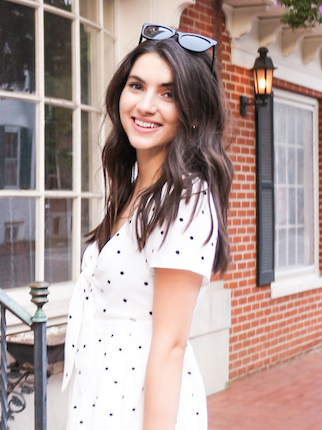 A button down is definitely my go-to piece of clothing in my closet! For a simple but stylish look, pair a crisp white button down with a fun pair of skinnies! Try tucking one side in and leaving the other out! This pair from Zara is definitely on my wishlist because 1. I love the zipper details and 2. they're navy (total selling point right there). Dainty jewlery and a cute cross body keep the outfit clean and simple! (P.S. I'm totally loving the Daniel Wellington watches...does anyone have one?) For the shoes, I went with something fun! These J.Crew flats are so eye catching and add something unique to the simplicity of the outfit! What do you think of this outfit? Where would you wear it to?